France’s advertising regulator has ordered fashion house Saint Laurent to remove posters of extremely thin models in “degrading” poses after an outcry over their appearance around Paris. Stephane Martin, head of advertising regulator ARPP, told AFP Tuesday that his organization had received 120 complaints over the way the posters depicted women. The authority bars all “degrading and humiliating” representations of people. 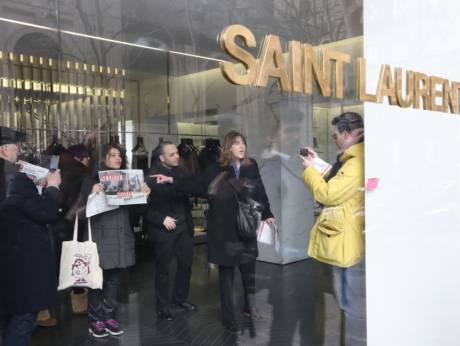 It has written to Saint Laurent asking them to “stop the use of these images, to withdraw them or to change them,” Martin said, explaining that a more detailed assessment of the campaign would be made Friday. Britain’s advertising watchdog banned a Saint Laurent advert two years ago that featured an overly thin model whose ribcage was showing. Saint Laurent has declined to comment. Ironically, the label made its name by putting women in men‘s tuxedos, a gesture that chimed with the rising feminist wave of the 1970s.